It’s Monday morning; you sit down in front of the computer to get some work done... and suddenly, it’s lunchtime. Where did all the time go? RescueTime is a Web-based service that answers this question. It not only tells you what you did with your time (as in, which apps or sites you used), but helps you figure out whether or not it was time well-spent. In other words, it makes it obvious just how badly you procrastinate. 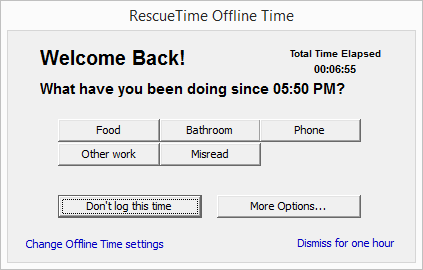 ”Where were you?” asks RescueTime’s desktop client. To use RescueTime, you install a small client on your computer, which sits on your system tray and basically snoops on everything you do. Every window, every website, everything gets recorded. It then uploads it all to the Web, where all the heavy lifting happens. The client is nearly unnoticeable, save for its annoying tendency to pop up on your screen and inquire where you’ve been, when all you were doing was just grabbing a cup of coffee. Thankfully, that can be disabled using the Web interface, though you may have to dig around for the right setting to change. 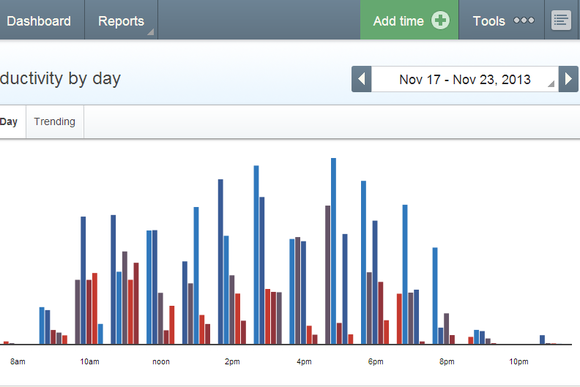 RescueTime’s browser-based interface displays your information using numerous reports, charts, and graphs. It used to be confusing in the past, but has recently been completely redone and is now both easier to use and prettier. 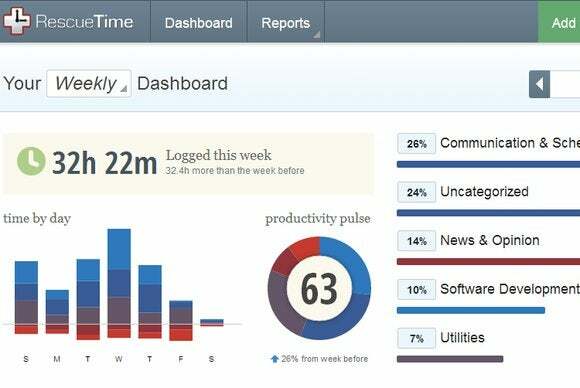 RescueTime’s main dashboard shows where your time went, at a glance. RescueTime tries to make it simple to see how productive you’ve been, using a metric called “productivity pulse,” which is explained on the RescueTime blog. In a nutshell, every activity you do during the day is assigned a productivity level ranging from “very distracting” to “very productive,” and the overall score reflects how your day went. For the productivity score to work, you must categorize your activities. Of course, for this to work, you must correctly categorize your various activities. This is both important and hard. Browsing Facebook is distracting, of course... unless you happen to work in social media. What about email? Is that productive, or a waste of time? That’s nearly impossible to answer, especially if you handle a mix of both personal and work email in Gmail, as many people do. Get this wrong, and you’ll find yourself harshly limiting the range of activities you’re “allowed” to do, resulting in a better score but actually diminished productivity (not to mention well-being). On the other hand, if there are sites you just know are distracting, RescueTime allows you to block them off completely, reducing temptation (until you reach for your smartphone, at least). Figure out at what time you’re most productive. 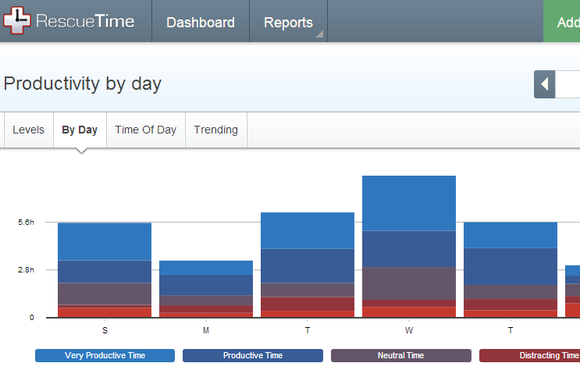 Beyond the dashboard, RescueTime offers a wealth of reports to visualize your productivity data in various ways. The one I found most interesting shows a typical day broken down by the hour, with a bar chart showing how productive/unproductive you’ve been during that hour. It was easy to see that my most productive time tends to be around midday, and that I do things I deem “distracting” in the mornings. There’s also a daily report, for figuring out which day is your most productive (Wednesday, for me). The new interface does a notably better job than the old one with presenting the reports clearly, but everything still lies on your being able to properly categorize your activities—and that part is as shaky as ever (not by any fault in RescueTime). If you want to get a better idea of where all your time is going, RescueTime has some interesting insights to offer. Just remember to take them with a grain of salt. 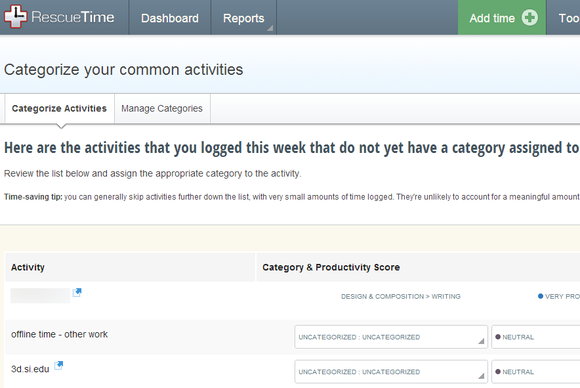 Once you figure out which activities make you productive, RescueTime can help you do more of those.